Wines from Pomerol are made in the Old World Bordeaux tradition. While Pomerol is the smallest region in Bordeaux, it also yields one of the most famous and expensive wines in the world. To fully understand the wine, you need to learn about the region. Bordeaux is one of the world's most well-known wine regions. As a matter of fact, it is so revered for its winemaking and viticulture that wine makers around the world produce their own Bordeaux blends which they make from the same type of grapes that grow abundantly throughout the original Bordeaux region. Bordeaux further breaks down into smaller regions, including Pomerol, Saint-Émilion, and Blaye. The Gironde River divides the region, and wines are grossly characterized as being from the Left Bank or the Right Bank. Pomerol sits on the Right Bank while Saint-Émilion sits on the Left Bank. Red Bordeaux wines contain a blend of grapes: Cabernet Sauvignon, Merlot, Cabernet Franc, Petit Verdot, Carménère and Malbec. White Bordeaux wines include Sémillon, Sauvignon Blanc and Muscadelle. 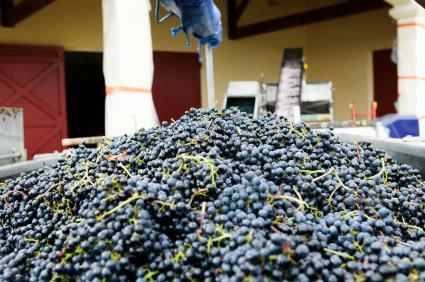 Left Bank red wines typically contain more Cabernet Sauvignon with lesser amounts of the other grapes blended in, while Right Bank wines, including Pomerol, are more heavily Merlot based. Wines from the Pomerol region contain Merlot, Cabernet Sauvignon, Cabernet Franc, and Malbec. The region plants fewer than 2,000 acres of grapes annually, yielding around 5.3 million bottles of red wine. Pomerol does not produce white wine. While the rest of the Bordeaux region uses a classification system that roughly judges quality and cost of wine, Pomerol does not classify their wines the way the rest of the Bordeaux region does. Instead, Pomerol winemakers, made up of many family-owned wineries, have avoided a classification system. Most wines from Pomerol age well, particularly those from good vintages. Typically, experts recommend aging a wine from Pomerol for 10 to 20 years before drinking it, with the ideal age of about 15 years. In this time, the well-structured tannins from grapes soften and provide the wine with a rich, rounded character. Flavors in the wine reflect the terroir in which they were grown, leading to a diversity of beautiful wines. Pomerol soil conditions range from rocky loam to clay, yielding an array of different flavors and characters. In general, you will find the full-bodied wines to contain hints of licorice and ripened or dried red fruits. The wines pair well with game meats, veal, and turkey. According to Robert Parker, the world-renowned wine critic, the following vintages were good to excellent in Pomerol. Following each vintage is a drink or hold recommendation based on the tannic structure of the wine. As you can see, some wine vintages reach maturity earlier than others. While Pomerol has some of the most expensive wines in the world, not all wines from the region will break the bank. The region has many affordable and delicious wines for under $50, and some cost less than $20 per bottle. This is especially true of excellent vintages, when ideal growing conditions yield superior grapes. Many wine shops sell Pomerol wines in either their Bordeaux or France sections. Ask your wine shop owner for a recommendation in your budget range. Pomerol wines provide a classic example of the quality of wines available in France's Bordeaux region. Visit your local wine shop to buy a bottle, and then give it a try. You'll be glad you did.